DG The Originals 463-613-2 78m ADD. 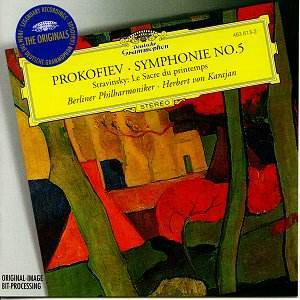 Karajan's famous recording of Prokofiev's Fifth was always hailed as the definitive account of this great work and now, newly refurbished and with extra remastering at mid-price it continues to hold forth with consummate ease over the competition. The taut structure is held together with a well-nigh perfect alertness. It appears that Karajan's 'work' over the piece paid handsome dividends for this recording is unsurpassed. Others have attempted this Everest of 20th century music most notably Koussevitzky, Weller and Jarvi although all but the former fall well short of the standard that Karajan and his Berliners set. It is a once in a lifetime reading and as such we are lucky to have it restored for posterity in such excellent sound. This is Karajan's second attempt at Stravinsky's 'magnum opus' and many would agree that this 1977 version is the one to have. The exacting bite and pungency of the BPO is married with a rhythmic intensity that is almost inexhaustible, considering Karajan's relapse in the middle of the sessions (vide Richard Osborne's colourful notes). The standard of playing is almost beyond belief, one has to hear to believe that such things are humanly possible. Comparing the earlier 1964 relay was instructive and I entirely agree with RO's statement that the later version improves considerably on the previous incarnation. Alongside the previous DG disc of New Viennese School works, this issue is another confirmation of Karajan's greatness in 20th century repertoire.